A perfect sterling silver keepsake gift for a baby. 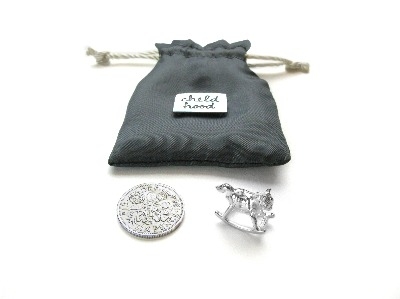 Two charms - a silver rocking horse and an old sixpence - to remind you of your childhood and a fresh way of seeing the world. As a keepsake this will constantly remind a special baby as they grow of how much you care for them. These two charms are symbols that will encourage them to remain open to experiences. A perfect christening or first birthday present. Be lucky. Enjoy health. Travel under a star. Tales From The Earth believe that small things carry big meanings and that a story can stir your soul. We want to say thank you or good luck to someone. We want to mark a birth or celebrate a coming of age. And always - always - we want to say I love you. These themes form the foundation of Tales’ silver jewellery and keepsakes collections. The designs, each with a bespoke message or story, are handmade to the highest quality and can be given for any and all of life’s milestone occasions. Lovely Lane think this is a perfect silver collection to help with memory making!